Retainers - Orthodontics - Orthodontist Hampshire, Ringwood. These are bonded onto the back of the front teeth. This is the only permanent option available for long term retention. interdental brushes must be used to keep bonded teeth clean post treatment. The more traditional form of retainer consists of a hard plastic that cover combined with a wire in front of the teeth to help hold them in place. Recommended for patients that have undergone expansion and is very durable. Vacuform or Invisible Retainers are removable retainers that cover all teeth with a clear plastic. 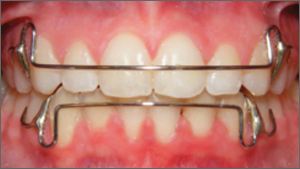 It is an excellent retainer to hold spaces closed and is a great cosmetic option. 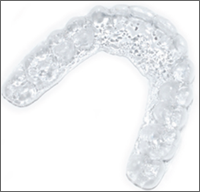 This retainer may require replacing more often due to the thin nature of the acrylic used.